"Learn about file and data access through WebDav and how to secure WebDav service"
What is WebDav? What does WebDav do? Web Distributed Authoring and Versioning is an extension of the HTTP protocol. WebDav is an access protocol for data that provides a framework for users to create, change and move documents on a server. It provides support for remote collaborative authoring of web sites and individual documents, as well as remote access to document based systems. WebDav enables seamless integration with the IIS Manager. Allows administrators to specify custom WebDAV file sharing with security. Supports both sharing and exclusive locks to prevent lost updates. Provides access to any cloud data by securing WebDav irrespective of whether the underlying cloud supports the protocol natively. About WebDav protocol: How does it work? Connecting to WebDav Servers and Windows Shares. Why WebDav as a Cloud Connector? Why choose WebDav over Common Internet File System (CIFS)? How to create a WebDav server? Securing WebDav Servers: Steps required to secure WebDav servers. 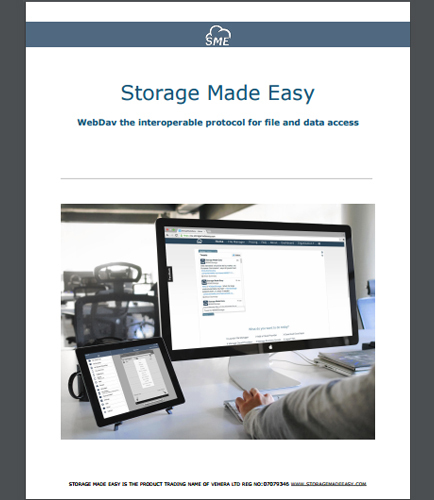 Download this whitepaper to learn more about file and data access through WebDav and how to secure WebDav service.